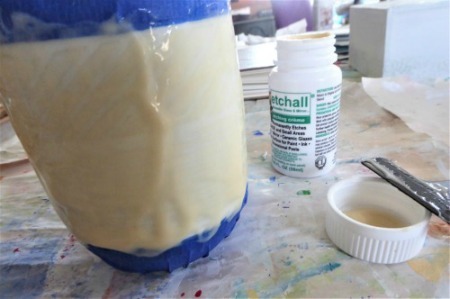 Here we are at Day 2 of the StencilGirl and Etchall Hop. 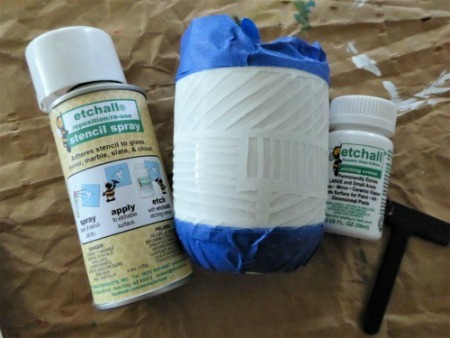 In an effort to "reduce, reuse & recycle"
using these Etchall Products for our current Hop. but settled on this broken white mug. I cut the stencil to fit the size of the mug. Following the directions on the product labels was pretty clear and easy. Adding color to the etched design was not hard either. The etching creme took the shiny glaze off leaving a rougher matte surface. I experimented with pens and different markers. Fabrico Markers, Pitt Pens and Sharpies are what I liked using best. Then I kept adding layers of color till I liked the finished results. Voila'! A pretty pen holder for my art desk. This is simply lovely! I have never tried anything like this but I want to! Adding color is a nice touch. Thanks for the idea! Really cool ! Love the watercolor effect ! 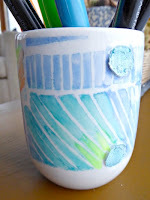 Great pastel colors - love the stencil you chose - always love a good recycled project! 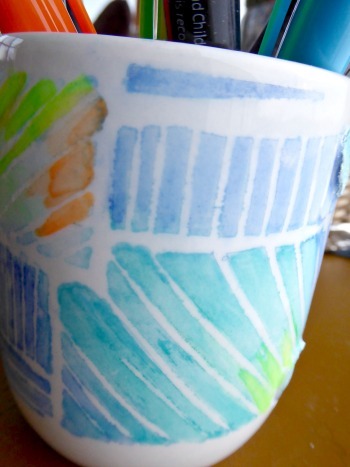 I love the idea of adding color to the etched areas! I wouldn't have thought to try & color it! Thanks! Now this was something new -- etching something that was a color! I know that Joe R. has said you could color the etching but I've never seen an example. 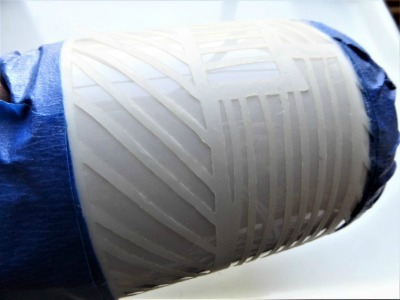 How marvelous your broken cup looks! I thought it was a small vase at first. Of course Cecilia. Thank you! Very cute Janet! 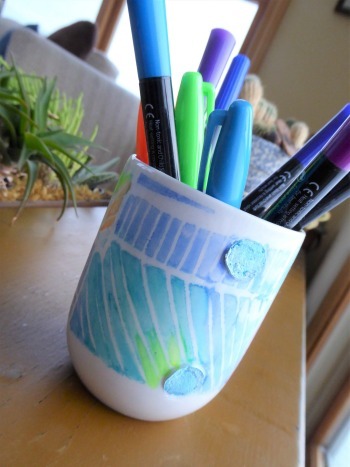 I love that you found a creative way to repurpose a broken mug! 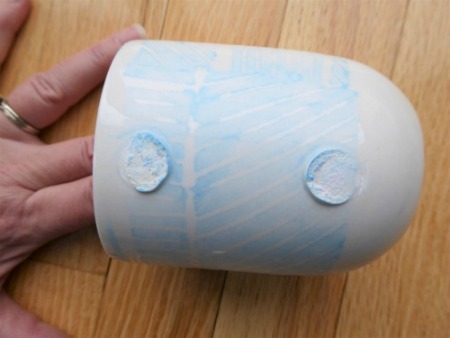 what a great way to rescue the broken mug! 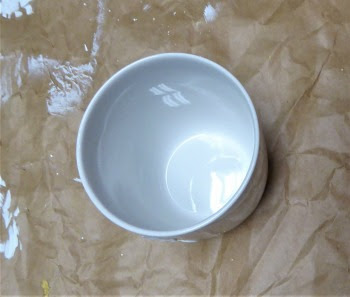 I find it helpful to know that the etching works on ceramics, and what you used for coloring - thanks! I love the addition of color! 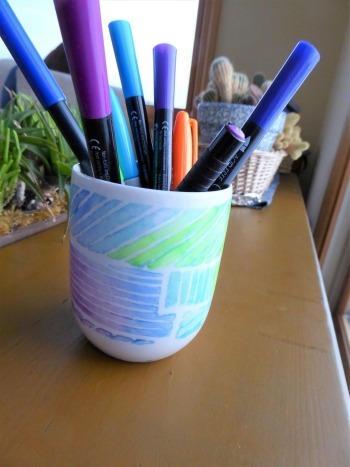 love your new mug, it's beautiful and very creative. super smart to use a "broken" item and make it new again! Very nice! I like the stencil you used. It looks great on the mug. This has been a very helpful and informative hop. 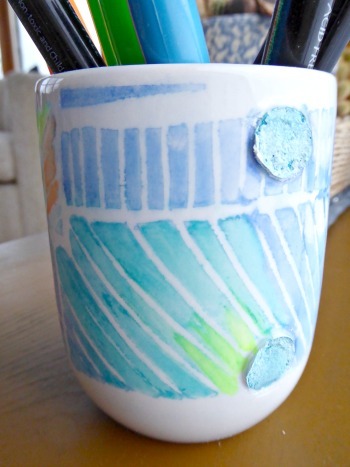 Great choice of stencil and love how you added colour to the etched part! 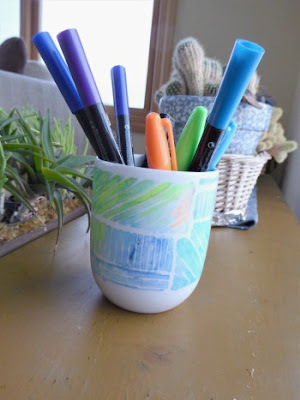 love the colors you have used! 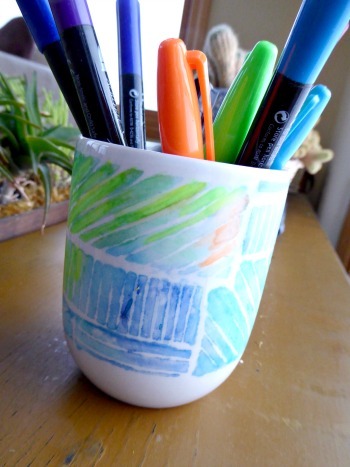 Very cute and easy idea!